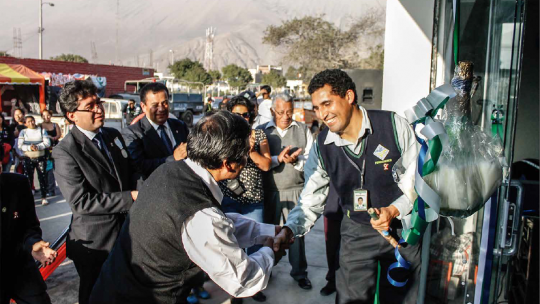 Few days ago, the MFI Fondesurco in Peru celebrated the re-launch of Acari branch. You can see on the pictures of the launch the manager of Fondesurco, all the business consultants and also the agency administrator. Except Fondesurco employees, also important personalities of the area participated to this event, as for example the district governor, the Red Cross and technical institutes representatives. This re-launch was completed by a very colorful parade in the streets of Acari, with all Fondesurco employees and inhabitants of the city. To finance projects of microentrepreneurs in Peru with MicroWorld and Fondesurco : click here !